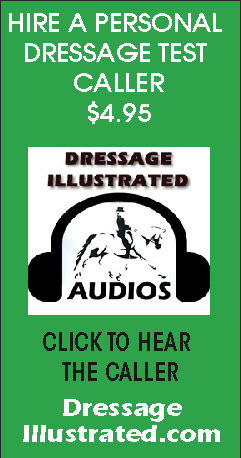 Dressage competition tests act as a check on the progress of the horse as it moves up the levels. 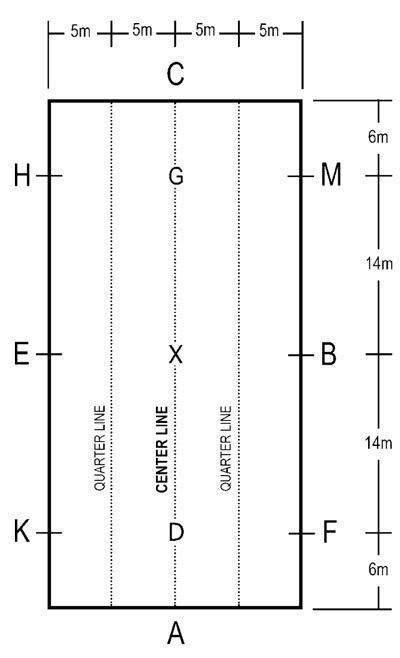 Tests are ridden in an arena that is either 20 meters X 40 meters or 20 meters X 60 meters and has letters that mark certain points of the arena. Where the letters originated from is not certain, but an article in the British Dressage magazine (June/July 2000), states that in the old Imperial German court, the walls of the stable yard were initially marked with letters indicating where each courier and/or rider’s horse was to stand awaiting its rider. Eventually, the royal stable yard was used for schooling, training and exercising of the horse, hence the current use of the letters in the dressage arena. Each horse competes individually at each level. Each level has several tests that involve variations of patterns of the same movements for that level. Tests involve movements based on the level of competency required by the horse and rider. Movements for each level are prerequisites for the next level. 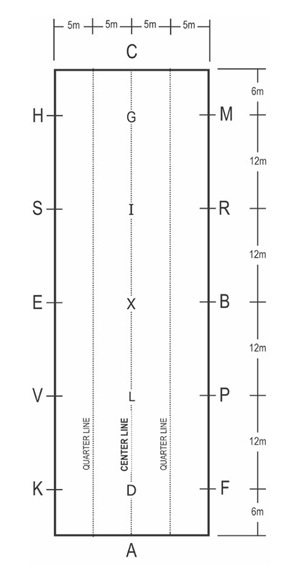 For example, if your horse cannot perform a 20 meter trot circle, as required in Training Level, he should not be ridden on a 10 meter circle, which is smaller and more difficult and which is required at the Second Level. Every test has an associated score sheet created with a series of boxes, where the judge assigns a score and often a comment for the movement performed. There are also five marks given at the end of each test called the Collective Marks: Gaits, Submission, Impulsion, Rider’s Seat and Position, and Rider's Correct and Effective Use of Aids. Some of the test movements and Collective Marks have coefficients associated with them which means they are worth two times the points assigned. Each movement is scored on a scale of 0 (not performed) to 10 (excellent). Total points for the test are added up and noted as a percent to the total possible number of points for that test. A percentage of 65% or higher is generally thought to mean the horse is ready to move up a level. Gaits: The freedom and regularity. Impulsion: Desire to move forward, elasticity of the steps, suppleness of the back, engagement of the hindquarters. Submission: The horse's attention and confidence, lightness and ease of movements, acceptance o the bridle, lightness of the forehand and straightness. Rider's correctness and effect of the aid.